Help your students improve their skills in multiplication and division with these 37 colorful charts. With a complete multiplication and division tables for 1-12, the charts make introducing and reviewing facts easy for you to conduct and for your students to follow along. Printed on sturdy cardstock, you can use these charts for daily reviews, classroom contests during arithmetic class, or simply display them as reminders. 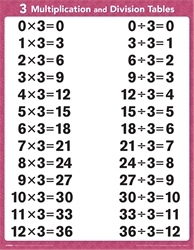 Develop mastery in multiplication and division with these practical visuals.